The Narconon® drug rehabilitation program, first established in 1966, is unique. It is a proven “get off and stay off drugs” program. The Narconon program has been used successfully by thousands of people around the world to rid themselves of the need for drugs and regain control of their lives. The Narconon program, unlike more traditional treatment, deals with both the physical and mental problems brought about by drug use. Our goal is to assist the addict, both mentally and physically, to become a whole and sane person capable of dealing with life’s many and varied challenges. The end result is a success rate that is 3 to 4 times that of other programs. None of these solutions involves the use of any drug. levels of toxins in the body to assist in recovery. 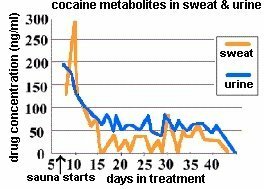 The graph depicts cocaine metabolites being excreted in the sweat and urine of clients participating in the Narconon® New Life Detoxification Program. Levels of drug metabolites are not detectable in clients prior to the start of this program, then increase dramatically and slowly taper off as the program is continued. This supports the argument that drug residues remain in the fatty issues and that the correct treatment can mobilize and remove them through the bodys excretory systems. »Reduction or elimination of drug cravings. »Reduction or elimination of many symptoms associated with drug addiction. These can include depression, irritability, and fatigue. »Ability to think more clearly. »Improved memory and attention span. »Increased sense of well being. complete a series of distinct courses designed to complement and expand on each other. Drug Free Withdrawal assists the individual to cease current drug use rapidly and with minimal discomfort through proper nutrition, vitamins and care from experienced Narconon® Staff. The Therapeutic Training Routine Course extroverts the student and gets him into better communication with others and the environment. The Narconon® New Life Detoxification Program is a precise regimen of exercise, sauna and nutritional supplements that rid the fatty tissues in the body of drug residues and other accumulated toxins. The Learning Improvement Course gives the student the ability to study and retain knowledge by recognizing and overcoming the barriers to study and learning. The Ups & Downs in Life Course gives the necessary knowledge to achieve greater personal stability and happiness in life. The student learns the characteristics of the social personality as well as the antisocial personality so he can spot the difference and better choose friends and associates. The Personal Values & Integrity Course gives the knowledge necessary to determine one’s own values and achieve high personal integrity and honesty. It shows how to correct contrasurvival actions by ridding oneself of past harmful deeds. The Changing Conditions in Life Course uses ethics and morals technology to apply exact steps that improve conditions in life and repair previous bad conditions. The Way To Happiness® Course teaches the student a secular moral code as a guide to living a happy life. The Narconon® Program Achieves A Success Rate of Approximately 70%. The Narconon® rehabilitation program uses methodology researched and developed by American author and humanitarian L. Ron Hubbard. Our goal is to assist the addict both mentally and physically to become a whole and rational person, capable of dealing with life’s many and varied challenges. A graduate of the Narconon program has recovered and will continue to stay well if he uses the tools he has learned and practiced while on the Narconon program. The premise of the Narconon model is that the former addict can achieve a new life.